Journey outside the Algo solar system, to a new star named Copt. In the colony world of Alisaland, young Alec and Mina embark on a quest that leads them to discover secrets they never imagined. Among them is the fate of Alis Landale, heroine of the original Phantasy Star, who returns for another adventure. A title screen from an early version of the game is shown here. 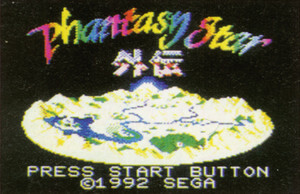 In the final game, this colorful logo was replaced with a more traditional Phantasy Star style logo. Until 1999, precious little information was available about this game. Due to the game being released only in Japan, most fans of the series didn't even know it existed. This was one of the few sites where you could even find a mention of the game. Phantasy Star Gaiden has not been officially released outside of Japan. Thanks to the hard work of dedicated fans, however, it is possible to play some of the games in English through unofficial translations. A translation patch was released in March 1999 by Magic Translations. The group altered some aspects of the game's story, but the game became accessible to many more fans thanks to their efforts.